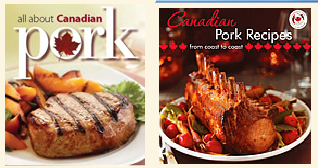 Pork Marketing Canada produces cookbooks and resources designed for Canadian consumers, professionals and industry members. All materials are FREE and are conveniently available in downloadable pdf format by clicking on the appropriate link. A 27-page guide including nutrition information and delicious new recipes. Eight special recipes pairing Canadian pork with other locally-grown ingredients represent the delicious bounty of our country. Easy-to-prepare recipes that are healthy, delicious, and created especially for diabetic diets. Available in English and French. As a parent, you can feel good about serving pork to your family. Try these "Kid-Approved" recipes tonight - many can be ready in under 30 minutes. Cook, eat and go...Six delicious pork meals in under half an hour! On the go?...Cook it slow! Delicious Pork recipes that let the slow cooker do all the work! A colorful 24"x36" poster based on Eating Well with Canada's Food Guide. Find out detailed nutrition information about your favourite cut of pork. Pork is a nutritional "powerhouse" with energy, protein, essential vitamin and minerals! There's more to pork than just chops! Choose the perfect cut for every requirement. Canadian can receive print material by mail - may take 4-6 weeks for delivery.